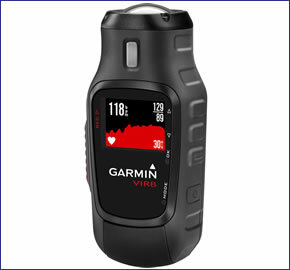 Garmin VIRB is an action cameras for capturing video during sporting and leisure activities. The VIRB includes a 1.4 inch colour screen and the unit is switched on by using an over-sized button. There are numerous mounts available for the VIRB so you can mount the camera just about anywhere. You can also record in many different modes with differing screen resolutions and frames per second for differing video image qualities. There is also numerous settings for taking still photos. Additionally a digital image stabilisation feature allowsfor better video recording. You can also adjust for lens distortion. View accessories here. Garmin VIRB has been discontinued. The Garmin VIRB has been replaced by the VIRB X and VIRB XE models. You can however buy genuine accessories for the VIRB Elite here. The Garmin VIRB is an action camera for capturing up to 3 hours of video and still photos and it has a 1.4 inch Chroma colour screen which uses minimal power. There are multiple mounts suitable for various activities including dash mounts, handlebar, helmet, shoulder, multi-use strap mounts and there are also adapters that allow the use of other industry mounts. The VIRB is also built to be rugged and waterproof to IPX7 standards so you can use it in up to 1 metre depth of water for up to 30 minutes. If you intend to use the Garmin virb for activities that involve water immersion then it is advised that you buy the Dive case which allows you to use in water up to 50 meters in depth. Video can be recorded in many different modes including 1080p at 30fps, 960p 48fps, 720p 30/60fps and 848x480 120fps. You can also record in slow motion for up to 120fps. As a guide, you can record up to 3 hours at 1080pixels. Extend the time you can use/record with the VIRB by buying an extra battery. You can also take photos with the VIRB Elite at either 16 megapixels, 12 megapixels or 8 megapixels. You can take photos one at a time, using Photo Burst (6/s) or Time lapse (various intervals). Also photos are taken with a 16 megapixel CMOS processor, providing manageable file sizes. It is easy to know you are recording even if wearing gloves because there is a slide switch. Whats more there are preset recording profiles available. For example, in ski mode, the device will record during the run and then pause when you reach the bottom of the slope. You can adjust the settings on the device using on-screen menu settings. There is a Digital image stabilisation mode which ensures you record a smoother video adjusting for bumpy conditions, for example. Lens distortion correction further helps to enhance the quality of videos. 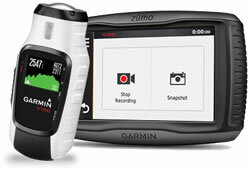 The Garmin VIRB is also compatible with the Garmin zumo 590LM motorcycle sat nav whereby you can control the VIRB via the Garmin zumo 590 5-inch display. There are many mounts for the VIRB. For example you can mount the VIRB on the handlebars of your bike, on top of your head, on your shoulder, on a cars dashboard or windscreen and many more places. Looking for accessories to use with the Garmin VIRB handheld device? We sell a vast selection of genuine parts and spares including VIRB carrying case, remote control, large tube bike mount, premium heart rate monitor and lithium ion battery.